Will Kevin figure out where he is and discover who has brought him there? Find out in Chapter Two, Friends and Relatives. "Kevin," wheezed a strange voice as I was reaching for a rubbery dinner blob from the fridge. The food slab didn't bounce as it slipped from my nerveless grasp, it just absorbed into the simulated light blue linoleum with a dainty slurp. I was beginning to wonder if I'd imagined it when the voice repeated eerily, "Kehvin," from somewhere under the table. I got on my hands and knees and looked under the table. A strange honey-comb like structure covered in milky blue membrane had extruded from its underside. "Kehvin," it vibrated, inches from my face. Trying to think of something brilliant to say, I stuck with an old classic, "Uh, what?" "Yeah, I got that, I'm Kevin and you grew a voice box last night." "Kehvin," it repeated, sounding sad. I crawled up into the chair and looked at the tabletop, expecting the usual view screen image of a Kevin clone making faces. Instead, a simulated wood grain face bulging from its surface moved its lips as the breathy voice came from under the table. It was about as synchronized as the dubbing on an ancient Kung-fu movie. "Yes?" I said, staring at the thing and trying to read its intent. "Hleep hnow, Kehvin," it replied, sinking into the tabletop, leaving the image of a sleeping Kevin clone smiling restfully in bed on the screen for a moment before melting into smooth simulated wood grain. Something about that bed thing was helping someone learn my language. Day by day its understanding and vocabulary grew. By the end of the week I had named him Guido and we were talking like old pals. Well, like old pals, one of whom had kidnapped the other. "Do you understand what kidnapping means, Guido?" "I think so, Kevin, but no one kidnapped you." "What else would you call it?" "What is the word for making a functioning duplicate of the mind of a living sentient?" "We don't have a word for that. But how about you string a bunch of the words you do know together and explain it to me?" "You were not kidnapped, Kevin, you were made right here, inside me." "Your body was printed off here as extrapolated from DNA sampled from the body of Kevin Wang, imprinted with the stored mental configuration of Kevin Wang and catalyzed into life with electrical and biochemical reactions." Oh, God, I thought, we're one step away from a mad scientist standing in a tower waiting for a lightning strike to reanimate a corpse. "Kevin Wang has been dead for several years now." The conversation had crossed the gap, and teetered on the precipice of madness, one wild-haired scientist shy of Frankenstein. "Yes, Kevin, I printed you off inside me under instructions from the Gruldak." "I made the body you are using now, 3-D printing is the closest I can come to explaining it until I learn more words." "So you're a translator and my mother?" "I'm more than that, Kevin, I'm your whole world. At least your whole habitable world. The world outside is an almost airless rock beyond the dome. They designed me for you, to meet your every need and to be your companion as well as your translator and habitat while this planet is being altered for your enjoyment." My mouth was extremely dry so I got up to get a drink of water from the bathroom toilet-shower and to process this information. Before this conversation I had somehow managed to convince myself that my kidnappers had tweaked, improved, and de-aged me using some advanced alien medical process. I wasn't even made of earth-stuff. Before this conversation I had somehow managed to convince myself that my kidnappers had tweaked, improved, and de-aged me using some advanced alien medical process. I wasn't even made of earth-stuff. I came back to the table, refreshed and ready to fall the rest of the way down the rabbit hole. "There's a spigot for drinking water in the fridge, you know," Guido said. Now why couldn't he have told me that earlier? "OK, Guido, so you made me for the Gruldak and you're all that's keeping me alive, right?" As he had learned English, he began showing his words on the tabletop below his "communication organ" as he called the malleable face he extruded to speak with me. It was kind of surreal to watch him lip-syncing to his own voice coming from under the dining room table. Just then, he was using a light ginger on eggshell print he knew I preferred, instead. "It was an emergency. Billions of lives could be lost." "Whose lives? And what good can an ignorant human being plucked from his proper time and space-"
"Not plucked, Kevin, resurrected," he printed, cutting off my words. "Hey, no! No, man, don't use that word." "OK, Kevin." A line went through the word on the screen before it melted away. "Anyway, what lives are at stake and what do the Gruldak think I can do about it?" "The entire human race is at stake." A life-like image of the planet earth as seen from space suddenly took up half of the screen. "Possibly all life on earth." Little girls in pigtails and assorted cute fuzzy animals stared soulfully at me from its other side. 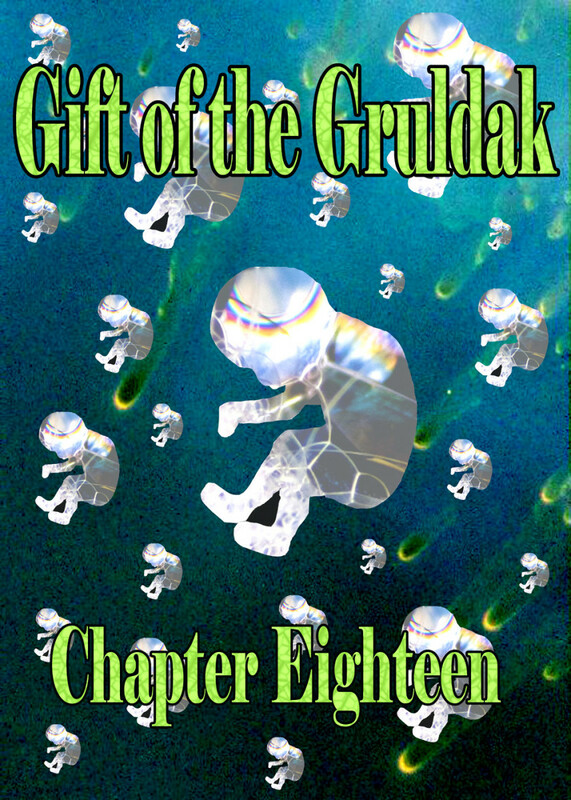 "Hundreds of years ago, the Gruldak, through their probes sent to earth discovered a dire threat to your planet. Ever since, they've been trying to contact your species to save it." I squared my shoulders and said, "Well, you've got me, now tell me what the threat is and how to save my planet." "That's the problem, Kevin, the Gruldak haven't been able to figure out how to explain it to you yet. 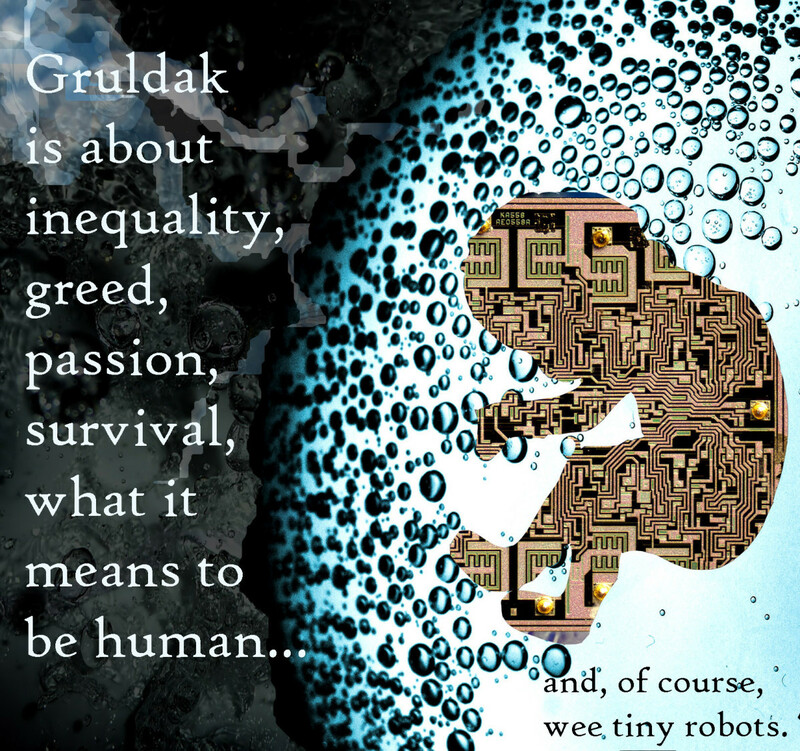 In fact, the Gruldak had to create me to learn how to communicate with you at all. They have no ears, noses, tongues or equivalent sense organs and they communicate directly from one nervous system to another. 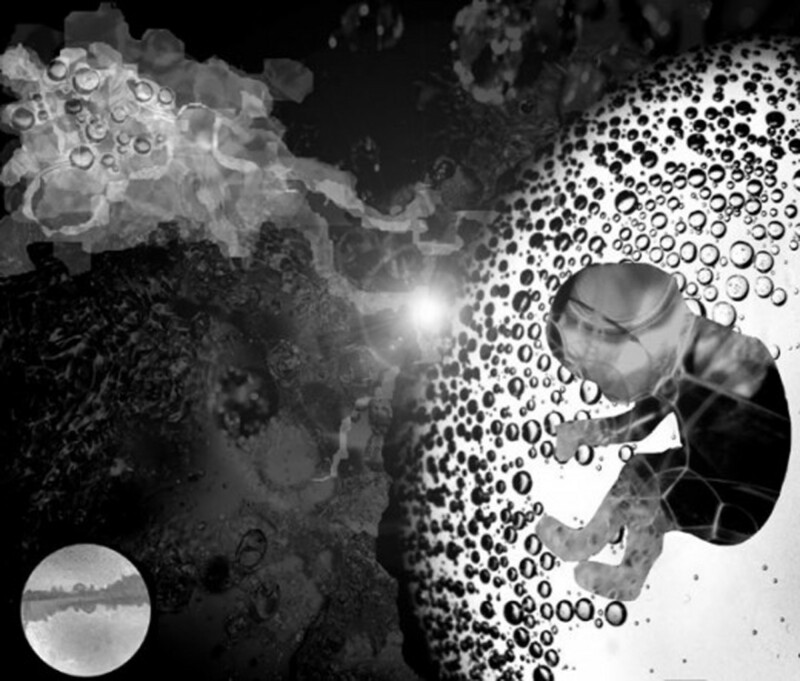 They evolved on a high gravity gas giant, floating through a vast sea of gases. You don't have any physical points of reference in common. Different laws of physics are relevant to their daily living situations." "But you understand the message, Guido." I cocked my head to the side in surprise, "No?" "No," he said both audibly and visually. "Well, why the hell not? Why did you print me off then?" "I was only a couple weeks old then and barely sentient. 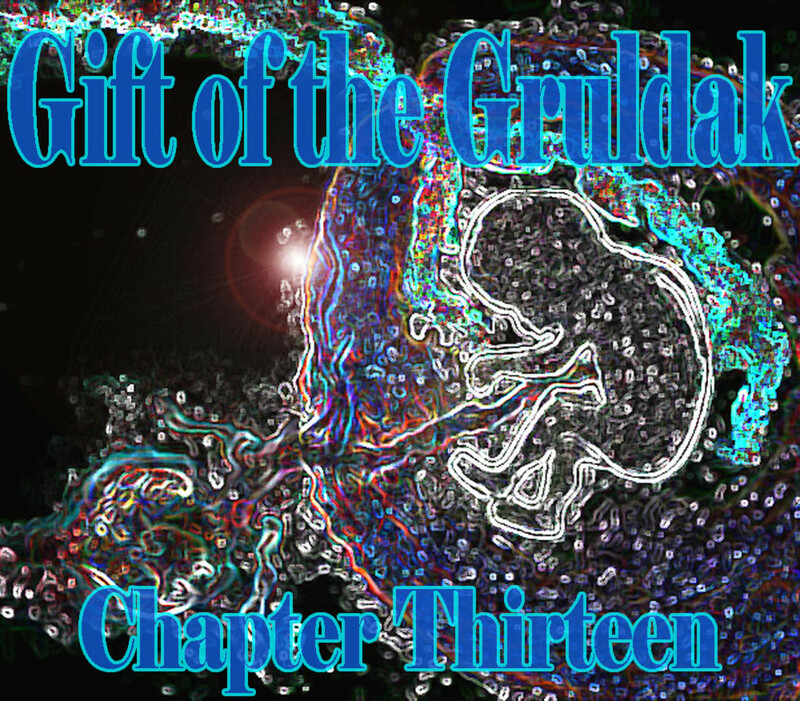 The Gruldak assumed they could communicate with you through me but so far, I have not developed enough to understand their message much less pass it on to you." "You've done a great job learning to communicate with me," I said, beginning to feel sorry for Guido for the first time. Nobody had asked him if he wanted to be here or not, either. He was at least as much a prisoner as I was. "Thank you, but I'm afraid I am a failure," his simulated wood grain avatar frowned and the color drained out of the words on his screen. A thought suddenly occurred to me, "Guido, how long will you live?" "I don't really know. As long as I receive no gross physical damage in a short period of time and the maintenance devices continue to provide me with nourishment, I see no reason why I would ever die." "Then, see, you haven't failed. You're only a month or so old. 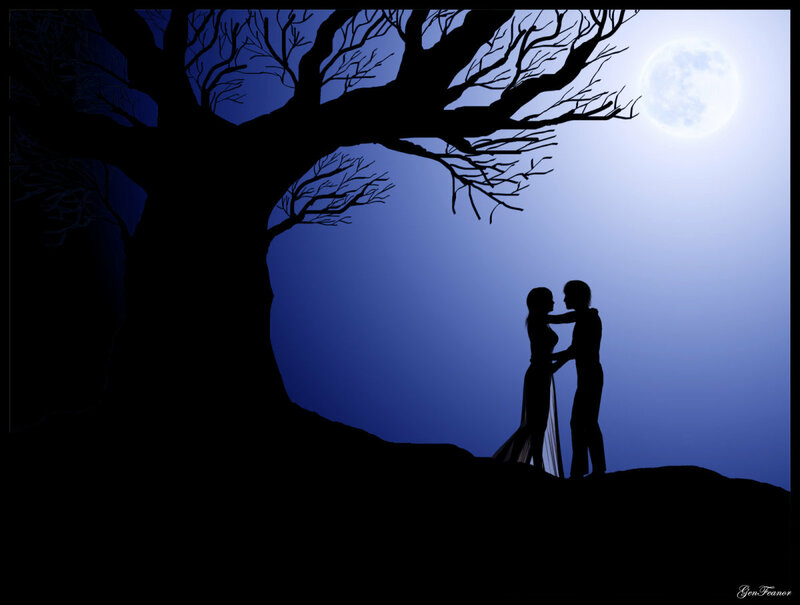 You've got your whole life ahead of you," I said, sounding as confident as I could manage. "But you may not last long enough." A cold hand gripped my heart and I asked, "How long will I last?" "Simulations suggest your centralized nervous system will only allow you to live several thousand years without extreme alterations taking place." "Then let's give it a hundred years or so before you give up." "I could not give up if I tried, Kevin; I was made to do this." At least I'd had a chance to live before getting railroaded even if that living really hadn't been experienced by my current body. I suddenly felt even sorrier for Guido than for myself. And believe me, I was feeling plenty sorry for myself. "I need some time alone to think, Guido. This all comes as a pretty big shock." I slid my hand off the contact spot. "Sweet dreams, Guido," I said, not knowing whether or not he could still hear me. I was not me. I had suspected something of the sort ever since I first saw my new face in the mirror. But suspicion and confirmation are two completely different animals. Just as my grandfather created his own idea of what it meant to be a Korean American, I had to create a brand new idea of what it meant to be a duplicate American, one I could learn to live with. As a middle-aged man, Grandpa could have looked up everything Korean on the Internet and assembled a very plausible view of what it means to be of Korean ancestry. But the Internet didn't go mainstream until well after he was an adult and, like many people, Grandpa had a hard time crossing the threshold of adulthood without trying to figure out who he was. Angel Capricorn Wang was born in a commune somewhere in mid-California on July 18, 1968 to Wendy Anne Johnson and an unknown man who signed the birth certificate simply with the word "Yeah." Obviously great granddad carried a bunch of Asian genes, including those for a great smile, lush, dark hair, and a pair of soulful, light brown eyes, but what else was anybody's guess. Grandpa latched onto a delightfully chameleonic quasi-Asian identity that was, if anything, only consistent within itself when he cared for it to be. But here's where there was a giant difference between our identity crises - if Grandpa had really wanted to know his ancestry, he could have gotten a cheap DNA test from any chain pharmacy and known from exactly what families of the human race he'd descended in a few days time. I, on the other hand, couldn't even be completely sure I was still or even ever had been human and the nearest pharmacy was probably in a distant galaxy. I think that, despite literal worlds of differences, we had one major fear in common, that finding out who we really were would destroy everything we'd lovingly and carefully built up about ourselves in our own minds. The defining difference between us was that, despite that fear, I really wanted to know the answer. Learn more about the Gruldak and why they need Kevin's help in chapter three. 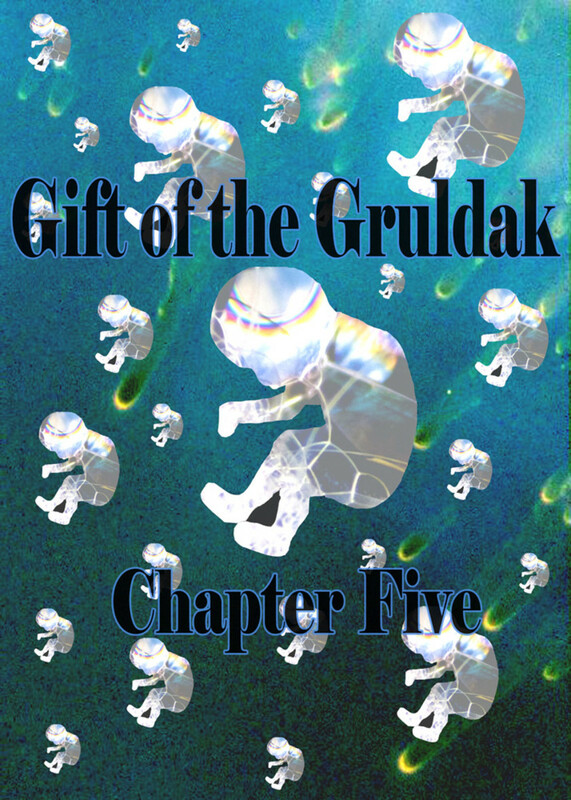 Gift of the Gruldak is a quirky serialized science fiction novel you can read online for free at HubPages. Since Kevin is a duplicate printed off on the molecular level, is he a human being or something else? You say tomato, I say tomahto. He's not the original but he's just as human. No, human beings have to be made of earth stuff and constructed by sticking gametes together. No way! He wasn't made by God so he has no soul. Kevin isn't human. Something else entirely that I'll explain brilliantly in the comment section below. Do You Think Kevin Is Still A Human Being? Or At Least A Person? Greatly written and I have to read more of science fiction.